Against conventional wisdom, we’ve just published the staff manual for FixMyStreet Pro online, where it’s easy for anyone to access. When we were putting this manual together, we thought we’d have a quick google round for other council SAAS documentation, to see if anyone was doing it particularly well. We didn’t get very far, though — it seems there’s a culture of corporate secrecy amongst other suppliers, and a fear of publishing such materials in case of imitation. It seems that our decision to publish our entire manual online, along with a handy print version, freely available with no password, is perhaps a little unusual. We’ve gone our own way on this one for a few reasons. First, because it helps our clients. We know that it’s far easier for customers to look online for materials than it is to remember where they’ve put a physical handbook. We know we could have put it behind a password, but that just adds an impediment for our existing customers, as well as for anyone hoping to understand the service a little better before making a purchasing decision. Plus, who remembers passwords for something they might only be accessing a couple of times a year? It’s just extra faff. This way, staff only need bookmark the documentation page, and they’ll always be able to find the most up to date version of the manual. There’s another reason as well, though. Most mySociety codebases — including FixMyStreet — are Open Source, meaning that anyone who wants to can inspect or use the code for their own purposes. If anyone really wanted to know our ‘secrets’… well, they’re already out in the public domain. We reckon there’s more to gain by publishing our instruction manual than there is to lose. Sure, competitors might see what features we offer, and they might even copy them. We’re confident, though, that our customer service, company culture, and our insistence on making our products as user friendly as possible, all give us an advantage that imitators are unlikely to be able to match. So, if you’re from a council yourself (or if you’re just curious) please do go ahead and read the manual. We hope you’ll find it of interest, and that it might cast some light on what makes FixMyStreet Pro different from other offerings in the field. We’re delighted to welcome two new councils who are now using FixMyStreet Pro for their fault-reporting: Buckinghamshire and Bath & NE Somerset. Residents in these areas can make reports on the councils’ own websites, where they’ll find FixMyStreet as the street fault interface — or through the main FixMyStreet website and app. Whichever you choose, your reports will be published in all three places. So far, so convenient for residents — but behind the scenes, there’s lots more going on that improves the efficiency of the whole fault-fixing cycle. Both councils are users of the Confirm CRM system, with which FixMyStreet Pro can now be fully integrated. What that means in practice is that when you make a report, it drops directly into the council’s existing workflows, with no need for someone in the middle to retype or redirect your report. Council staff can use the best of both systems’ useful tools for shortlisting, inspecting and updating the status of your issues — and when a report has been progressed to the next stage of the fixing cycle, you’ll be automatically kept up to date both by email, and with messages posted directly to your report page. In another advance, both councils are now displaying assets such as bins, trees and adopted highways in context-sensitive areas of the report-making journey, so it’s easy to identify exactly which one you’re talking about when you make your report. That saves time for you, and for the council when they go out to fix it . If you’re interested in the technical details, we’ll have more about both Confirm integration and asset layers in future blog posts. We’re making some pretty big improvements to the FixMyStreet for Councils service at the moment: improvements that will save councils both time and money, while giving them flexibility and insights into their fault report handling. This has been our core focus over the last six months, working with our customers to design a new category of case management system, for local government, and by local government. We’ve been working together with local authority insiders because they’re the people who know best what they require from a piece of software they will use every day. If you also fall into that category, we’d love to hear from you. We’ll be sharing early iterations of the improved service as we make progress. Your feedback will be part of that process, helping shape a service that does everything you need it to do. If you are from a local council and you would like to find out more, or you would like to provide feedback on early prototypes, help with user testing and become a part of our development process, we would love to hear from you. Those who want to find out more about obtaining FixMyStreet for Councils can do so by checking out our page on the Digital Marketplace. Earlier this week we hosted our Open Standards in Local Government workshop at Newspeak House in London, with the aim of unpicking where open standards might be of benefit and what might be stopping us from making more progress. We were joined by 20 smart people representing a bunch of local councils across the UK and it’s fair to say we made a good bit of progress. A number of consistent themes arose through our discussions. It was widely agreed that Open Standards are key to getting the basics right, and standardising the ability of different services to speak to one another is a prerequisite for a sustainable local authority service strategy. The insistence on compliance with open standards at the procurement stage should place an imperative on suppliers to build-in interoperability and reduce the fear of vendor lock in – councils shouldn’t inadvertently replace one set of closed systems for another. This link between adoption of open standards and the procurement process was fundamental. In our opinion demanding compliance from suppliers to agreed open standards up front, is probably the single most important thing that central government could do to help local government. Phil Rumens from LocalGovDigital introduced recent progress on the development of the Local Government Digital Standard. Notably, it goes further than the equivalent in central government, with an emphasis on reuse of existing data and services, and commitment to make more data open and reuseable. Both the LGA through LG Inform, and GDS via standards.data.gov.uk already look to gather standards for use in central and local government; however adoption by local government often lags substantially behind. Simply put this is a conversation that doesn’t really happen outside a small number of web or digital staff within councils, and the wider group of service staff don’t yet understand the opportunity that open standards represent. Indeed, Tom Symons from Nesta who introduced the Connected Council’s report, highlighted that the councils furthest ahead are those that have both put in the hours to achieve proper internal Governance standards, and have benefitted from leadership by the Chief Exec and Senior management team. The biggest need we identified was to showcase great examples of how open standards can lead to better outcomes in practice. Showing what’s possible, both with case studies and live services that can be adopted was seen as essential, especially when this leads to actual financial savings and better outcomes for the citizen. This is something we’re keen to put some time into in the future. Sarah Prag and Ben Cheetham shared their experiences of collaborating on the DCLG led Waste Standards project. The most interesting thing for me was how a group of committed individuals just decided to get on with it and find some funding to make it happen – a proper coalition of the willing. The second half of the workshop looked at what we should focus on next. 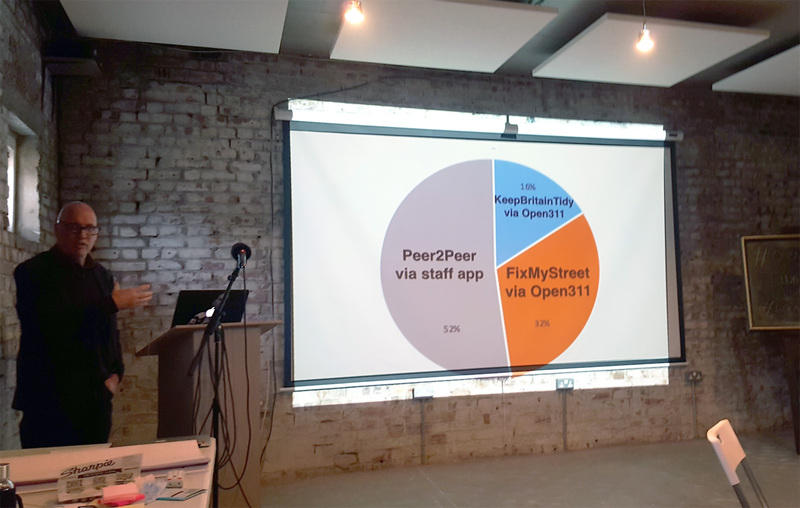 We were particularly keen to build on the progress that we’ve made in popularising the Open311 standard, which we can use to integrate FixMyStreet.com with each local authorities’ systems. We heard two contrasting experiences, firstly from Chris Fairs at Hertfordshire, who employ an extensive internal management system for issue reporting including individual definitions for fault types. They discovered that citizens are not so good at judging the severity of potholes – and through triage inspection, around 40% of reports are downgraded due to misreporting. This contrasted secondly with the experience of Nigel Tyrell and his team at Lewisham who have recently adopted an Open311 enabled service, now linked into both FixMyStreet.com and LoveCleanStreets. Perhaps the most surprising aspect of Lewisham’s experience is that well over half of reports actually come from their own internal staff using the system. This peer to peer approach has been transformative for them, with frontline staff motivated, more in control, more engaged with and connected to residents, and better able to integrate citizen reports into their own workflow – a very neat solution. As with any such event the real value comes in the following weeks and months as we look for ways to collaborate together and opportunities to put into practice some of the things that we discussed. We’ll certainly be planning follow-up events in the future, so if you’d like to get involved sign up for our newsletter, post a comment below or get in touch at hello@mysociety.org. Public health teams, policy-makers, councillors and NGOs often need facts about a specific area. If they’re looking for data on things like the number of smokers, the demand for hospital beds, or the birth rate, they turn to their regional Health and Wellbeing Board. These local authority committees are required to produce a document known as a JSNA (Joint Strategic Needs Assessment) every few years. It’s a snapshot of the demographics and healthcare needs of the local population, and is used by a variety of stakeholders including policy makers and strategy groups. 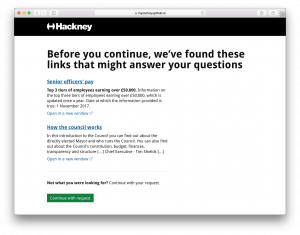 Like most local authority committees, the London Borough of Hackney and the City of London Health and Wellbeing Board have previously produced their JSNA as a simple read-only PDF document. But, in the digital age, they knew that there was more they could do to make this document accessible, useful, and engaging. That’s when they called us in — not to build the final digital version of the JSNA, but to help them understand the possibilities and ensure that they were heading down the right path. 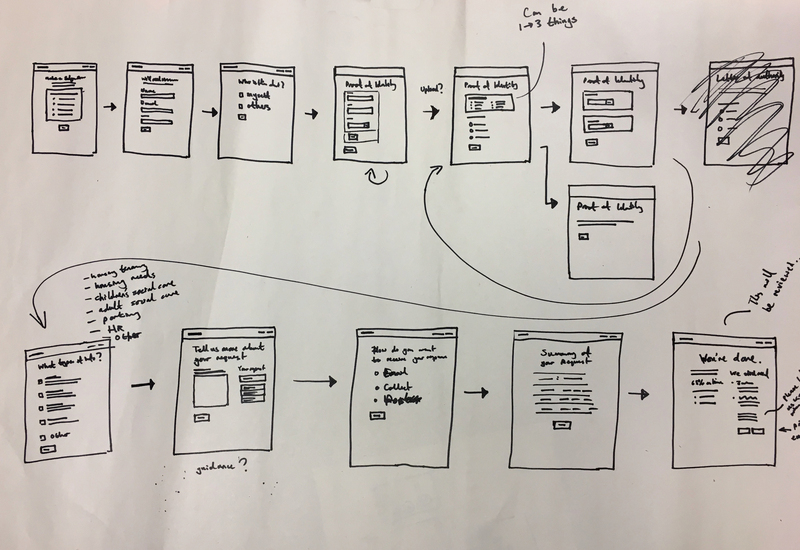 We’ve written up the whole process in a case study, so, if you’d like to know more, read on.